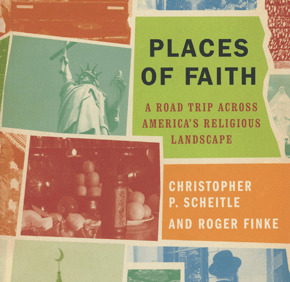 “Places of Faith: A Road Trip Across America’s Religious Landscape” by Christopher P. Scheitle and Roger Finke. Oxford University Press (New York, 2012). 240 pp., $27.95. Each of the book’s chapters focuses on a different destination, with additional short “views from the road.” The primary sites are Memphis, Tenn.; Houston; Colorado Springs, Colo.; San Francisco; Salt Lake City; central Nebraska; Detroit; Brooklyn, N.Y.; and central Pennsylvania. The chapters provide some history and a broad religious overview of the area; a site-specific experience of the authors — often in a worship setting; additional commentary and analysis; and a brief list of related references and further reading. The authors, scholars who “have each published extensively on historical and national trends in American religion,” appear to limit their approach to many of the sites by using mainline Protestant Christianity as their baseline for comparison. References to “a typical Protestant congregation” and Catholic worship “similar to Roman Catholic Masses conducted everywhere” seem to belie the book’s basic premise of America’s “ever-changing religious geography” with “a rich and varied topography.” Of the many religious leaders interviewed in this exploration of diversity, only two were women. The book is uneven not only in its treatment across regions and leadership, but also in its treatment of the different religious traditions and of the groups within them. Though pointing to America’s rich religious variety, the authors presume the reader to be Christian or at least quite familiar with Christianity. A Christian reader might learn of the “five pillars” of Islam, or of the Jewish law contained in the Torah. A Muslim, a Hindu or someone unaffiliated with a religion would not learn any of the basic tenets that undergird Christianity. Learning about a religious tradition other than one’s own can be a rich and rewarding experience. This book provides some pieces toward this exploration, with interesting statistics, entertaining anecdotes and interviews, and compelling photos. But for a more comprehensive, expansive and extraordinary resource on the American religious landscape, see Harvard University’s Pluralism Project at: pluralism.org. For a road trip that provides more breadth to American Christianity, see “Sundays in America: A Yearlong Road Trip in Search of Christian Faith” by Suzanne Strempek Shea, Beacon Press, 2008. Kantor, a writer and lecturer, lives in Boston and has a doctorate in religion and society from Harvard Divinity School.